Gov't Mule is a southern rock/jam band formed in 1994 as a side project to The Allman Brothers Band, but has taken on a life of its own. Like many jam bands, Gov't Mule does not get much radio airplay but is popular due to constant touring and intense fan loyalty. When the Allman Brothers Band reformed in 1989 in response to the popularity of the Dreams box set, Warren Haynes was added on lead guitar and Allen Woody on bass. When the Allman Brothers Band reformed in 1989 in response to the popularity of the Dreams box set, Warren Haynes was added on lead guitar and Allen Woody on bass. The two shared a love for '60s power trios, like Cream, Jimi Hendrix Experience, and James Gang. With no bands making similar music in the 90s (except ZZ Top), Haynes, Woody, and former Dickey Betts drummer Matt Abts came together as Gov't Mule during Allman Brothers' breaks. (It is likely that Haynes and Abts first met during the recording of the Dickey Betts Band CD "Pattern Disruptive" in 1988.) 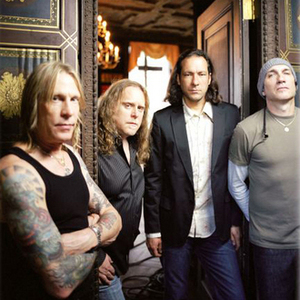 They released their debut album the selftitled Gov't Mule in 1995. It was followed by Live from Roseland Ballroom. When it became apparent that the Allman Brothers weren't planning on recording any new material, Haynes and Woody left to concentrate full-time on Gov't Mule in 1997. Dose, the studio follow up to their first studio effort, was released in early 1998. They were joined by members of the Allman Brothers, the Black Crowes, and Parliament/Funkadelic for their 1998 New Year's Eve concert. This was released in both a two and four CD version as Live ... With A Little Help From Our Friends. The band exposed some of their roots with covers of Neil Young, Free, Traffic, Jimi Hendrix, Black Sabbath, Mongo Santamaria (via John Coltrane) and Frank Zappa. In 2000, the band released Life Before Insanity to critical praise. Many thought that this would be Gov't Mule's breakthrough CD. However, Woody was found dead in New York City in August. Haynes and Abts considered breaking up the band but did stage a concert called "One for Woody" to raise money for his daughter's education. The Allman Brothers, the Black Crowes, members of the Grateful Dead, and other friends of Woody also performed at the concert. At both the "One for Woody" performance and other shows, Haynes began appearing with the Allman Brothers Band again. With Dickey Betts' departure from the Allmans, Warren came back full time to the band at the beginning of 2001 and has continued splitting his time between the Allmans and for a period Phil Lesh and Friends and the reformed Dead as well as Gov't Mule (performing acoustic gigs with just Haynes on guitar and Abts on percussion and as The New School Of Gov't Mule with Widespread Panic's Dave Schools on bass and Chuck Leavell, formerly of the Allman Brothers and known for his current work with the Rolling Stones on keyboards). The next year, Haynes and Abts began to record a tribute CD using Woody's favorite bass players. These sessions resulted in two CDs The Deep End, Volume 1 (2001) and The Deep End, Volume 2 (2002). A documentary of the recording sessions was also made by Phish bassist Mike Gordon called Rising Low. Bass contributions to the CDs came from Jack Bruce of Cream, John Entwisle of The Who, Mike Watt of Minutemen, Les Claypool of Primus, Flea of the Red Hot Chili Peppers, and Chris Squire of Yes among others. When it came to touring in support of the Deep End CDs, Haynes and Abts used a revolving door of keyboardists and bassists. Keyboardists included Chuck Leavell, Rob Barraco of Phil Lesh and Friends and Zen Tricksters, Phish's Page McConnell and Danny Louis. Bassists included among others, Dave Schools, Oteil Burbridge of the Allman Brothers, Les Claypool, Victor Wooten of The Flecktones, George Porter Jr. of The Meters, Greg Rzab formerly of The Black Crowes and the Buddy Guy Band and Andy Hess, also formerly of The Black Crowes. Louis and Hess were eventually added as permanent members of Gov't Mule. They continue to tour extensively and have become staple acts at many music festivals including Bonnaroo, Wakarusa, Vegoose, and their annual New Orleans Jazzfest night show (where they filmed and recorded the last show of the Deepest End tours, with 17 guest musicians in a 6 hour show) wich was released on CD/DVD as The Deepest End, Live in Concert. The first CD with Louis and Hess Deja Voodoo was released in September 2004. Additional material from those sessions was released in 2005 as and EP entitled Mo' Voodoo. The new lineup's second release, titled High and Mighty, was released on August 22, 2006.